Sector expert Michael Ballanger details his forecast for precious metals markets in the second half of 2018. Given the impressive reversal in gold last Monday, which appeared to occur during the Asian and European trading sessions as opposed to the Crimex pit session, it looks like the precious metals are adhering to the well-broadcasted seasonality trade that has been fraught with random, rather than dependable, trading results, especially in the last four years. 2014 and 2016 had poor second-half performances, while 2015 and 2017 were marginally positive. 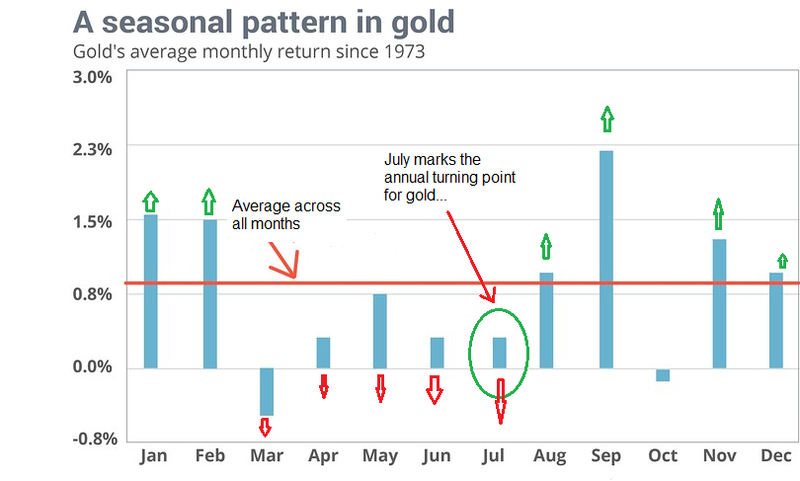 What isreliable is that gold purchases in July have a greater chance for a successful trading outcome than any other month of the year, assuming, of course, that you took profits when gold popped in one of the following five months. You can see from the chart posted below that in the months that follow July, five out of six have returns that exceed the monthly average, with the standout, September, being followed by corrective behavior in October. It has been postulated that accelerated and highly competitive buying by the Italian jewelry trade and Diwali in India accounts for strong September showings. 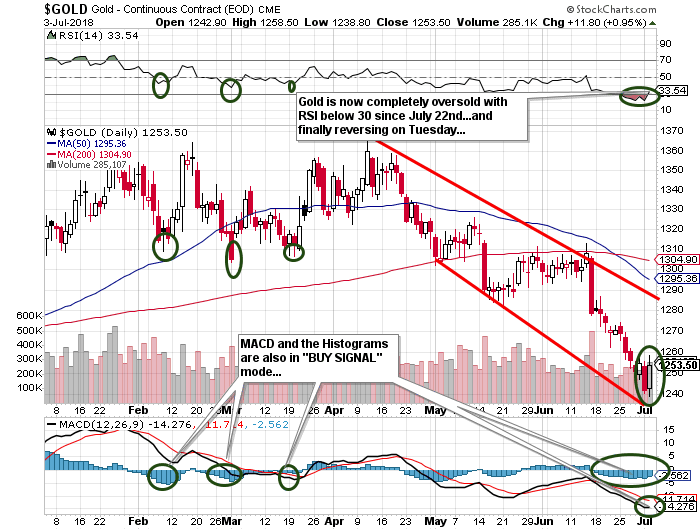 Conditions in the gold pit are identical to those encountered at major bottoms in the past three years, with RSI (relative strength index), MACD (moving average convergence divergence), and the histograms all in troughs that have led to strong and very tradeable rallies. This is where I take some additional positions on as "trades" and others as "put-aways." If I can afford a $50,000 bite, $25,000 goes to a trade and $25,000 to put-aways, but the first tranche is designed for a scalp. I have been staunch believer in the predictive nature of gold mining stocks since I first began tracking them in 1978. However, the usual Internet blogosphere is once again bountiful with opinionados that think they know more than they actually do. I have used the ratio of gold bullion to gold mining shares in the past and the GTSR (gold-to-silver ratio has usuallybeen strongly reliable in calling the turns, but they are not alwaysreliable as shown by the incredible "fake-out" that nailed us in 2015-2016. In late summer 2015, I was buying the JNUG and NUGT calls for February and June expiry all based upon the growing outperformance in November of the miners compared to the metals. However, I stood by horrified in the very early New Year when they started to not just correct, but actually crash. 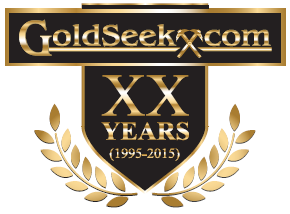 By January 19, 2016, the HUI had broken 100 and the GDX:GOLD ratio was the lowest reading in over twenty-five years. I am currently short the GTSR, and early last week came very close to lifting the "short gold" leg of that very successful paired trade put on in April at 82.75. I tried to lift it by buying back the GLD shorts, but I was bidding too far under the market ($117.20). The best it could do was $118 on Thursday, only to sag to $117.40 on Monday while I was on the boat in the Massassauga Provincial Park with only intermittent Internet signals. I fear that I may have to simply ride out the paired trade to my 65 target, but that will take a major assault on $21.15 silver and $1,375 gold. 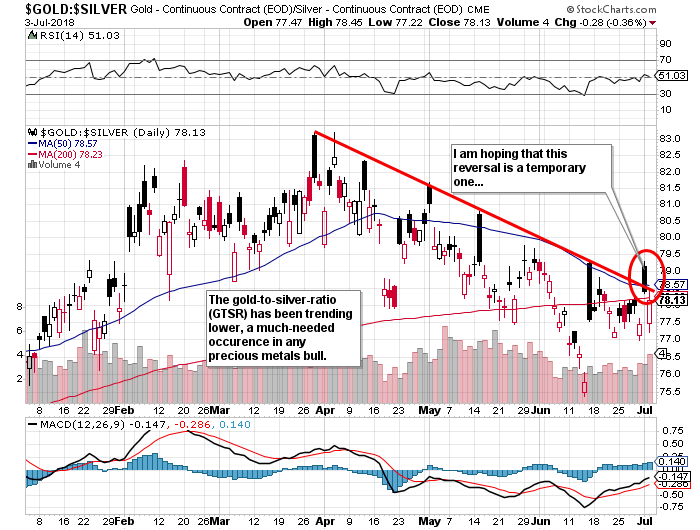 If I simply lift the gold short at $1,250 (GLD $118.00), I only need $19.35 silver (SLV $18.10) to accomplish my objective. Before I embark on some dogmatic diatribe on the precious metals outlook and who and what are responsible for the unyielding assault on prices since last April, look no further than the base metals, where copper and zinc have once again entered bear market territories. It was only four months ago that I was debating a few of the clowns in the CEO.CA forum about "The Zinc Trade" and why at $1.66/lb. supply would magically appear out of nowhere forcing the LME (London Metal Exchange) inventories upward and negatively affecting price. All they could spin out was the same bullish case based on supply disruptions that I was writing about in 2011, when Tinka Resources Ltd. (TK:TSX.V; TLD:FSE; TKRFF:OTCPK) discovered the Ayawilca zinc deposit. As I have always maintained, when the reasons for owning a stock show up in the bullboards or chatrooms of the Internet cesspool, it is time to go the other way. 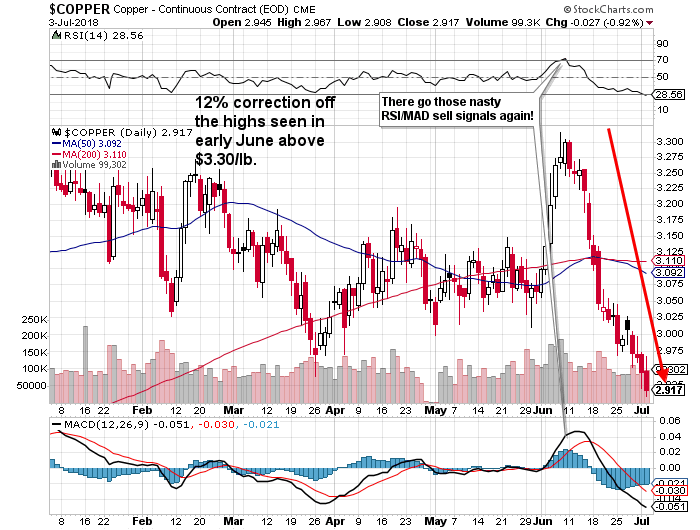 Dr. Copper has really taken it on the chin lately, and you can lay the blame squarely in the lap of the U.S. president, who is determined to penalize countries that have executed "The Art of the Deal" better than any previous American politician could ever have imagined. While the U.S. has been running around the globe for the last twenty years playing schoolyard bully, invading sovereign nations without provocation and forcing millions of Middle Eastern refugees from the region, China and Russia have been solidifying allegiances by way of good old-fashioned "business deals." Those deals are now no different than military alliances, and the Chinese have become masters at dangling gilded carrots in front of starving and destitute mules to win respect and ensure servitude. Adherence to the generational objectives of Chinese negotiators has become a fearsome fly in the ointment of Western business leaders. Whereas the corporate leaders in the U.S. and Europe must please only their shareholders, whose idea of a long-range plan is the closing bell of the NYSE, the CEOs of Chinese companies need only look to the Party for approval and tenure. Long-range corporate objectives remain generational for China, and that is why a severe market correction is not only possible, it is probable, with the debilitating effects being painfully more impactful upon Western markets and corporations than it would (and will be) for their Chinese counterparts. 3. Refer to points 1 and 2. That is most certainly an old and very corny joke but I simply cannot overemphasize the need for prudence and caution in all areas of investment selection. Markets are no longer a battle between humans and the dual enemies of fear and greed. It is no longer about being the strongest and the smartest and the fastest in terms of intellect and perseverance. Machinescan do all of that, and way better than we can. To which you counter: "But machines cannot predict human emotion because they do not experience it." To which I reply: "They see the emotional response to a price-changing event in nano-seconds and then move with such high-frequency velocity that they are able to front-run the human decision and skip to the front of the analytical queue without the silliness of any actual analysis." To that, I say: "Hand your money over to the quant-geeks and let the machines battle it out." Think about it. To allow a HFT (high-frequency trading algobot the ability to analyze your order to an exchange and execute before you is essentially stealing your proprietary research. It is corporate and intellectual thievery of the highest order, and it is what is ruining markets and driving thousands of brilliant analysts out of the business. 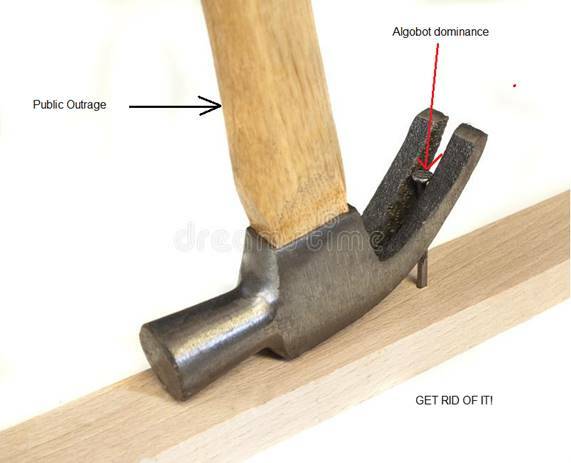 Here is the head of the nail meeting the claw of the hammer: If we don't extract the dominance of technology from the investment industry, idealists will no longer seek to use financial markets as conduits for the life blood of innovation. The liquidity event that is the sensible and infinitely logical reward of the retail speculator is being denied to them by interventions in markets that used to be driven by an absolutely wonderful combination of very healthy fear and greed. In the days before the algobots and central-banking-edict-driven markets, there was a palpable excitement in the air as the only "Fear" in the room was that you would miss your fill on 100,000 shares of Foofoo Mines, which was charging on drill hole speculation. Not to be outdone, Fear's nose-picking twin brother was inciting the investment crowd to riotous deportment, as "Greed" poured gallon after gallon of avaricious fuel on the tinderbox of raging human desire for recognition and advancement, and took away your 100,000 shares of Foofoo. Alas, the outcome was always the same: Some won; some lost; but copious amounts of money were raised and commerce prevailed. 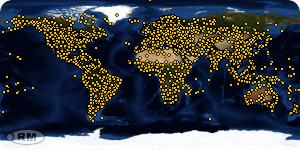 Through the mechanism of the venture capital markets in Canada and Australia, the wealth created through this process created entire industries in remote regions, enriching local indigenous peoples completely removed from the mainstream of public interest and commentary. The explorationists that I have known and admired in my career have always said that the most enjoyment they ever experienced was beforethey made the discovery and beforethey had acquired wealth. Most refer to wealth within the context of family and friends, and need not refer to a net worth statement as it was the direct result of capital markets functioning in the manner in which they were ideated. The problem that remains today is that no rational human will invest in a private company if he knows that the exit mechanism is flawed. In medical marijauna deals, there is a ton of liquidity and everything is functioning. In mining, it is absent. That, in itself, is bullish. 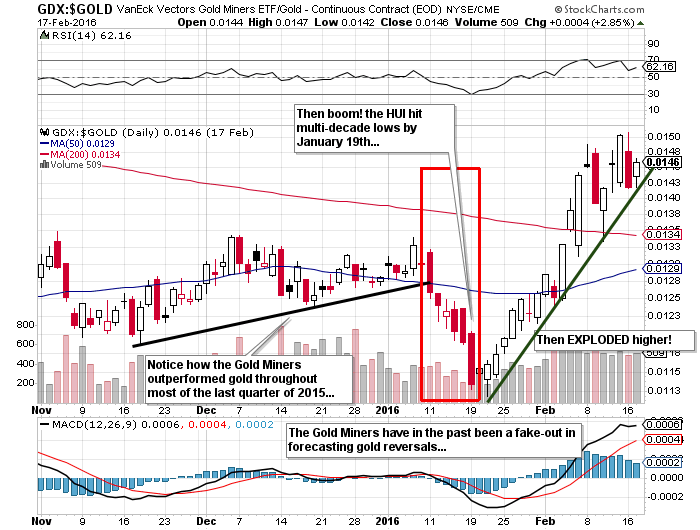 In sum, the time to be buying Gold and Gold Miners is right now. Sentiment, which you will recall was my primary driver for going "all-in" in 2015, is now fully in the category of "brutal," and as you all know, the equal and opposite reaction is always to "buy bruta" and "sell ecstatic," or as many of my penmanship brethren would say, "You want to be sellin' when they're yellin' and buyin' when they're cryin'. . ."
Happy Fourth to all of my numerous and wonderful American friends. The six years I lived in the Midwest, within the Heartland of the U.S.A., carry the second-best memories of my life, the first being finding my keys and my wallet two days ago in the boat with zero need from any one else. God Bless America.